When you want to create your own blog and/or photo gallery, the first thing you want to do, is to get a domain name. They're cheap (about 5 or 6 € a year). For that price you get email addresses with your own domain name as well. 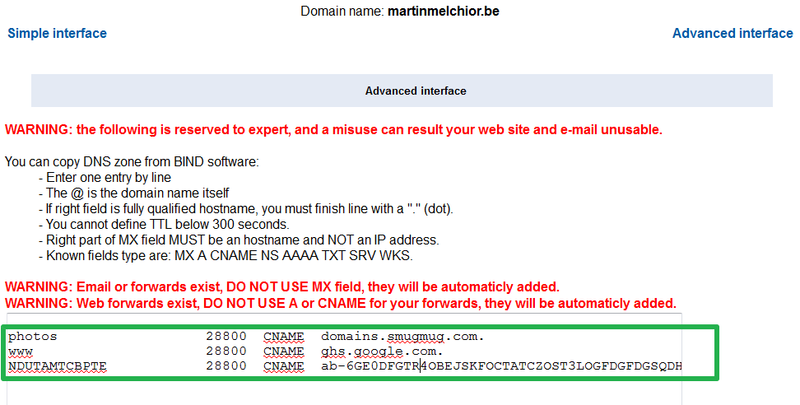 For 5 or 6 €, would you really want to have site name such as http://mart-mel.blogspot.com/ ? Here is just a thought, if some day you want to change the service provider and leave (e.g. blogspot above), without a domain name, you'll be stuck with your hosting and you won't be able to change that without changing your URL. Once you found the domain name of your dreams, registered, paid etc... you need to be slightly patient. DNS (domain name service) can be painfully slow (up to a day !!!). We'll come back to BookMyName.com to configure it once your blog and/or photo gallery are configured. This is an easy step... go to http://www.blogger.com and register. You will probably want to customise it to make it look more personal. If you want to create a picture gallery, my recommendation is to do it together on both sites to make sure them look alike. 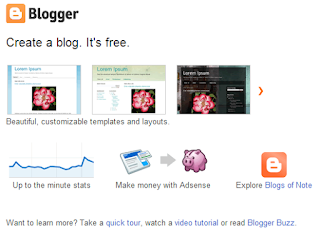 I'm not saying here that using blogger is the bet way to create a blog... I just found everything I need there for free. There are many picture sharing solutions online such as Picasa, Flickr, Facebook, and ... SmugMug. Storage is unlimited. No concern about reducing quality or deleting old files. This is a good backup solution. Cloud storage is not green: no need to destroy the planet for useless pictures nobody cares about. If you litter your galleries with pointless/bad photos, it will become harder to see your masterpieces. Too much info kills the info! By increasing your disk usage, you slightly reduce SmugMug margin. Who cares? I do: with higher the margin, SmugMug will have more money to improve their services/reduce their fees or avoid bankruptcy. They support domain names (60USD/yr formula). I can have http://photos.martinmelchior.be if I want to (and I do!). This is an easy step... go to SmugMug and register (with this link you an I both get a discount). You will probably want to customise it to make it look more personal. If you want to create a blog, my recommendation is to do it together on both sites to make sure them look alike. The DIY way: you set a "web redirect" which either simply redirects to the real address of your website/blog or hides it using frames (a html trick). In both cases, links to your pages will remain to the original domain (e.g. http://mart-mel.blogspot.com/) name and not the one you just registered. I did not want this. Column 1: the subdomain name. On the first line, you will read 'photos'. This means we're talking about 'photos.yourdomain.com'. Column 2: the TTL value. You can write 28800 just like I did... this is not critical. 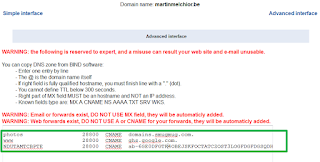 Column 3: you need to write 'CNAME' this indicates you're going to make a domain name (yours) as an alias to an existing one (in this case smugmug, the photo gallery service provider). Column 4: this is the existing domain name you're pointing to. in this case it is the smugmug server domains.smugmug.com. You need to finish the domain name with a '.' (dot) to indicate the DNS does not need to add 'yourdomain.com' (or whatever your domain name is) to the end of what you just typed. To know what to put in which columns, you need to refer to the service provider's instructions. Here are these instruction for Blogger and SmugMug. These instructions will also indicate the final step to you need to make to activate it on their side: this usually means you need to enter your domain name somewhere on their website. Note: some service providers like Blogger.com require to register two CNAMEs to work. You just need to do it twice (just like on the screenshot).